This is a photo by Astrid Kircher of John Lennon from Yahoo. Astrid befriended the Beatles whilst they were playing in Hamburg. 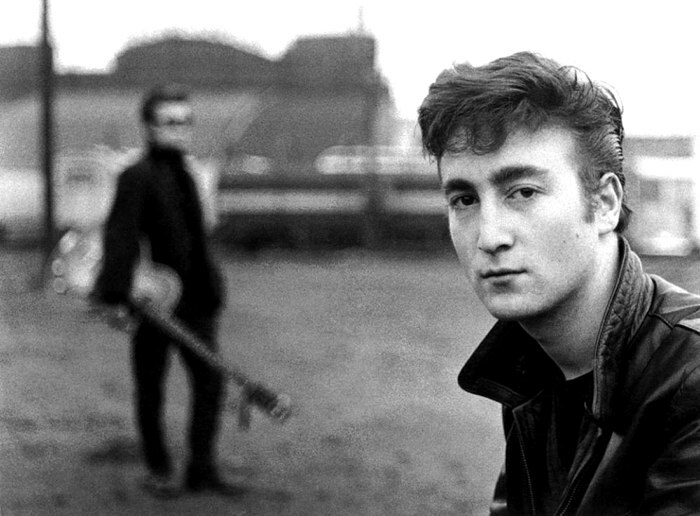 This is a black and white close up of John Lennon with his band mate Martin Sutcliff in the background. John was about 19 at the time. The deliberate blurring of the background makes the image of John pop. This would have been taken with a wide open lens, like f2.8. It’s a posed shot but still has a casual feel to it. Martin holding his Bass helps give the shot a musical connotation. Martin passed away shortly after this photo was taken and John was haunted by him for the rest of his life so his ghostly image here is appropriate.